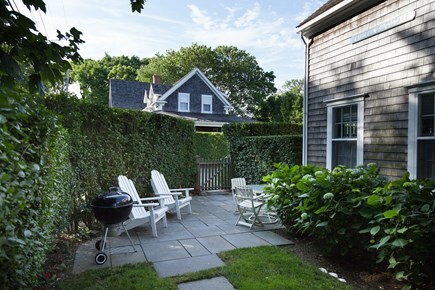 This charming, custom-built cottage with modern amenities is just 10-12 blocks to the shops and restaurants in Town. FIRST FLOOR: There is a living room, a dining area that seats 6, and stainless steel appliances in kitchen. 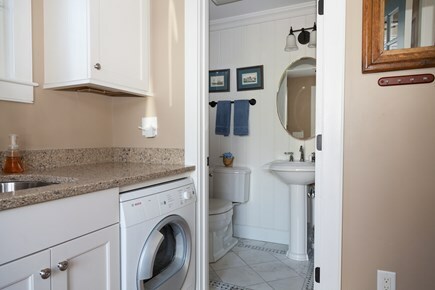 The laundry room includes a washer and dryer and a 1/2 bath. 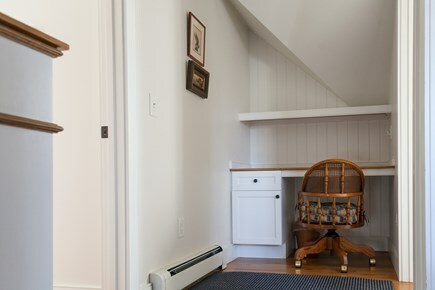 SECOND FLOOR: At the top of landing, there is a built-in desk/computer area. 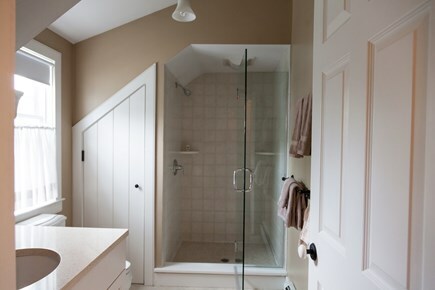 The master bedroom has a king bed, an oversize shower bathroom, and the second bedroom has two built-in twin beds. 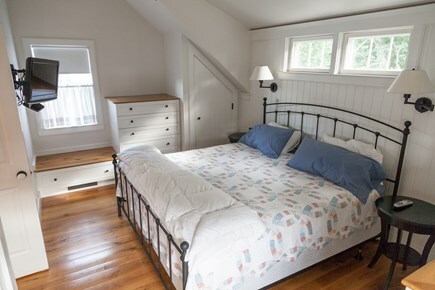 ''Kathleen's Cottage'' has all hardwood floors. There is a furnished, private patio with a charcoal grill, Adirondack chairs, and a dining set. 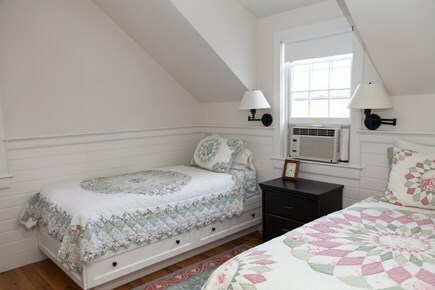 The cottage is in the Historic District, close to museums, restaurants, shops, docks, one block from Old Mill and its working demonstrations, and the African Meeting House. A bus on Pleasant St. goes to most beaches, circumnavigating the island for sightseeing or day tripping and accepting bikes. The owners live in a separate home on the property and quickly respond to your needs. We have well maintained bike paths on the Island. This summer is my fourth renting Kathleen’s Cottage -a gem of a house in a great location! It’s an easy walk to town and to the new restaurants and places near the Milestone Rd. rotary. The house is also super comfortable when you want to just chill at home. Kathleen is very attentive to details and will make sure your stay is wonderful. I settle in for a couple weeks when I go and always look forward to my next summer’s stay! 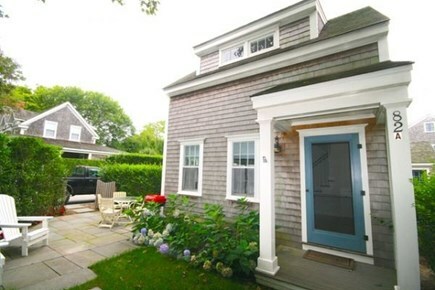 This house is a beautiful Nantucket cottage with good space, tons of charm, and well maintained. Location is about 20+ minute walk to town with children and not walkable to beaches. We often used Uber to go to the beach. Helpful for families with young children to know that this is on a busier road with no sidewalks. You have to walk a couple of blocks on edge of road to get to a side street to head into town. Walkable to the grocery store, some nearby restaurants, close to bike path. Home is in very close proximity to owners who made unexpected visits which is good to know if that would be bothersome to you. Owner was very responsive to issue with oven and while it was unable to be repaired during our stay, she kept us informed and did her best to try to resolve any concerns. May I suggest you are honest and forthcoming in any future lease agreements. Our lease agreement clearly says there is a maximum of four (4) guest, when in fact you truly are a family of five(5). Classic Nantucket. Everything about this house is perfect. Open, spacious, and bright. Tastefully decorated. ALL the amenities to make for a comfortable and fun stay. 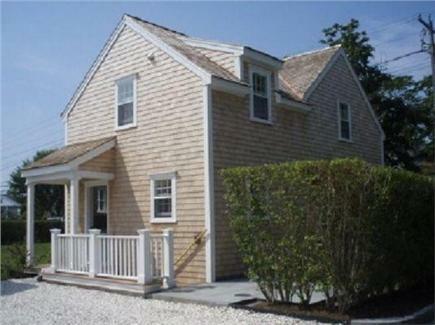 An easy walk to the heart of Nantucket town as well as grocery and restaurants. The home is as charming outside as it is inside. A lovely private outside area for relaxing or entertaining. You won’t want to o leave - I didn’t. My husband and I have stayed at the cottage a number of times and it has been a wonderful base from which to explore Nantucket. 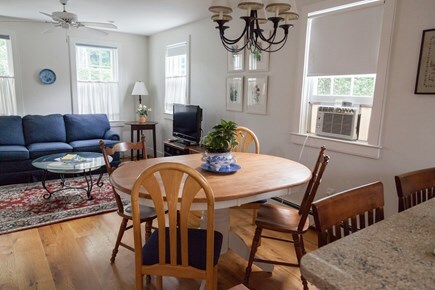 The cottage is centrally located and extremely convenient to downtown as well as the bike path and the large Stop & Shop on Pleasant St. to get supplies for our stay. 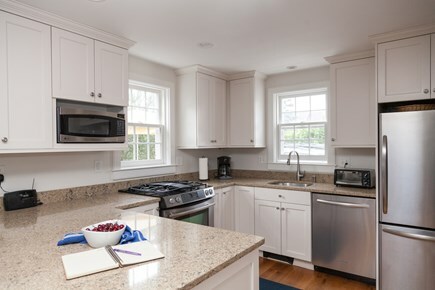 We usually cook in a number of nights and the kitchen is well stocked with new appliances. My husband, Tom and I live in the main house on the property. Tom is a practicing attorney and I maintain the cottage. We try to attend many of the island activities and enjoy riding on the many bike paths Nantucket has to offer on our tandem bike. “KATHLEEN’S COTTAGE” has all the comforts of home in a far away place. Come to enjoy the history and charm of this beautiful island. Nantucket is one of the most unique places one could ever visit. Looking forward to meeting you! Exceptional location in The Historic District from which to enjoy all the island’s amenities; walking, biking, or by car. Excellent location for relaxing and enjoying the sun without leaving the property.